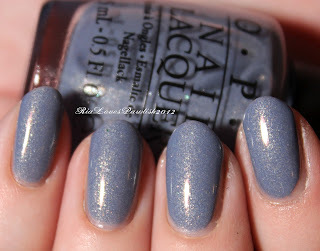 Ria Loves Pawlish: OPI I Don't Give A Rotterdam! tried a new barbecue restaurant today... i'm really picky so i didn't like it very much. i'm kind of lame, i like to go to the same restaurants every time and at each one i have one specific thing i always order... i'm definitely not adventurous with food! today we have the other blue shimmer from the 2012 OPI Holland collection, I Don't Give A Rotterdam! this is another one i'd buy just for the name! this is a favorite from the whole collection, i do love my blues! outstanding formula, it practically applied itself in two thick coats! this is far lighter than yesterday's color OPI I Have A Herring Problem. it's a light dusty blue with greY undertones and subtle silver shimmers... as with most shimmers, i added an extra coat of Seche Vite to really bring out the sparkle! one coat Seche Base, two coats IDGAR finished off with two coats Seche Vite.